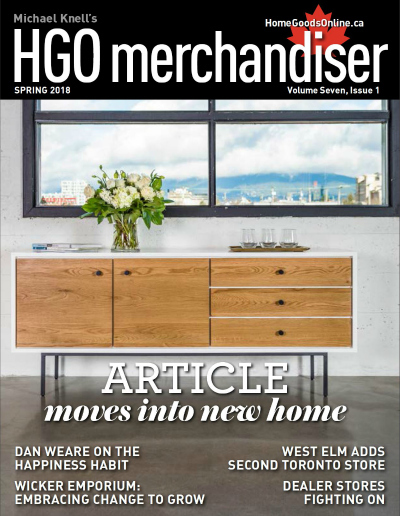 BRIGHTON, Ontario – If there’s a single, simple theme to the Spring 2018 issue of the HGO Merchandiser is furniture retailing is changing and it’s changing in ways those of us who’ve been around for a decade or three weren’t completely expecting. If you want to skip this introduction and get right to the heart of the matter, click here. Reading through this issue gives several examples of how the face of furniture retailing in this country is changing. The traditional mix of furniture, mattresses and major appliances is falling away in many of the new ventures – and some not so new family firms – that are bursting onto the scene. These innovators are mixing furniture with a broad range of other products, everything from kitchenware to soft goods. This issue, our steadfast contributing editor, Ashley Newport, profiles the Halifax-based Wicker Emporium. It seems that without anyone noticing, this second generation family owned and operated enterprise has managed to create a network of some 22 stores throughout Atlantic Canada and Ontario by embracing change – it has both an active social media presence and a growing e-commerce store – as opposed to fighting it. Adopting a digital-first strategy has made Article, the Vancouver-based e-commerce specialist, one of the fastest growing furniture retailers in Canada. They’ve just moved into their brand new headquarters, which was designed to support their aggressive push to become a billion dollar player in the very foreseeable future. It’s a goal they plan to attain by changing the traditional paradigm under which consumers buy furniture. Speaking of new locales, West Elm – part of the expanding international home furnishings empire being created by the publicly-held American retail giant Williams-Sonoma – recently opened a second store in Toronto, which features product from local artisans and craftspeople, such as unique furniture pieces made from reclaimed and salvaged wood as well as coaster, letterpress stationary and handcrafted soap with essential oils in small batches. Several former Sears Hometown store licensees are emerging from the ashes of what was once this country’s most important and influential department store. In a report from the newest addition to HGO’s reporting team, Greg Simpson, we learn that while they may be bitter about what happened to them, they remain determined to carry on. This is good news for the industry at large and the communities they serve. In this issue we also introduce our newest contributing expert, retired furniture retailer Dan Weare. Writing under the Solutions Café flag, Dan starts off writing about what he calls “The Happiness Habit.” As he notes, happiness for a retailer is often hard to find. Usually because it’s a process and from his perspective, it begins with doing things right, right from the start and that, in turn means, getting the count (the inventory count, that is) right. 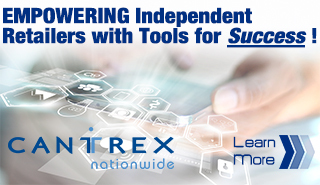 Click here to download the Spring 2018 edition of the HGO Merchandiser. Happy reading!